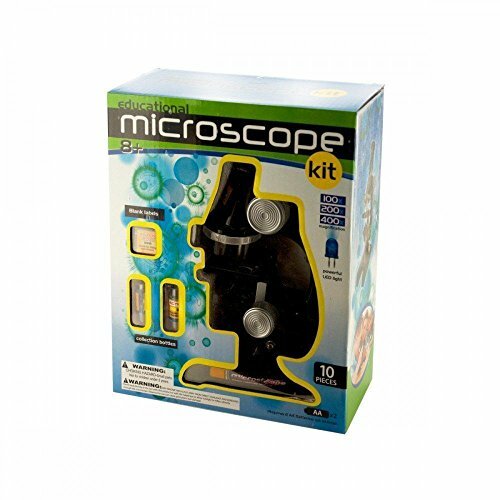 Perfect for inquisitive kids, this 10-piece Educational Microscope Kit features a refined microscope with 100x, 200x and 400x magnification, a powerful LED light and everything needed to collect, label and view small specimens and objects. Kit includes: microscope, collection vials, blank labels, 1 prepared slide, 4 blank slides and tweezer. For ages 8 and up. Requires 2 'AA' batteries (not included). Comes packaged in an individual window box. Box measures approximately 7.5" x 3.5" x 9.5".